Before she was arrested following an immigration protest, Daniela Vargas dreamed of becoming a math professor and soccer mom, with three kids in an SUV. JACKSON: Before she was arrested following an immigration protest, Daniela Vargas dreamed of becoming a math professor and soccer mom, with three kids in an SUV. Now the 22-year-old friends describe as all-American girl may be deported without a hearing to Argentina, a country she hasn't seen since she was 7, when her parents fled a collapsing economy and violated a visa waiver program to work in Mississippi. Her attorneys said they filed a motion Friday with the Department of Homeland Security to allow Vargas, now detained in Louisiana, to remain in the U.S. until they can make her case before a judge. For now, she's being processed as a "visa wavier overstay," which could deny her a hearing and put her on a plane to South America. "She said she was in a cell with other girls. She hasn't even taken a shower yet because she's scared to," her friend Jordan Sanders said. "She has no clue what's going on." Sanders said federal agents in two unmarked cars pulled them over five minutes after they left the news conference in Jackson, where Vargas had joined clergy, civil rights lawyers and advocates in speaking out against President Trump's immigration policies. "They rushed around the vehicle and opened Dany's side of her door and they were just like, 'You know who we are, you know who we're here for,'" Sanders said. The agents drove off with her in handcuffs. It's a shock for the young woman who did so well playing trumpet in her high school band in Morton, Mississippi, that she got a solo in the state band finals. She went to community college and then the University of Southern Mississippi, having twice obtained protection from deportation under the Deferred Action for Childhood Arrivals program. "Every time we talked it was like she was finding new pieces of herself," said Macy Hudson, a classmate from the same town of about 3,500 people in central Mississippi. She described dragging Vargas to meals at Olive Garden and catching up on their favorite television shows. Other friends describe her as a hard-working high school honors student and former altar girl who tells jokes to anyone she meets. She had to drop out of college for lack of money, and was working multiple jobs, at a cellphone provider and a health-food restaurant, to go back. The DACA program — derided as "illegal amnesty" by critics — has protected about 750,000 immigrants since the Obama administration launched it in 2012. It allows young immigrants who arrived as children and are living in the U.S. illegally to stay and obtain work permits, good for two years at a time. Vargas' latest permit expired in November, and she hadn't been able to pay the $495 renewal fee until February, when she reapplied, said Abigail Peterson, one of her lawyers. 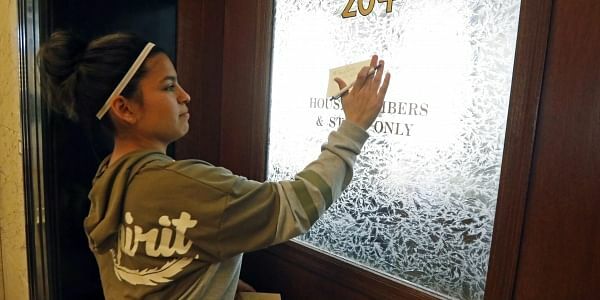 They hope to be able to tell a judge that she has no criminal record (a search by the Mississippi Department of Corrections, done at the request of The Associated Press, showed no convictions), and that she deserves to stay because her DACA status was being renewed. Her neighbors are attesting to her value to the community in a letter writing campaign, supporters say. While much of rural Mississippi gets left behind and the state's overall immigrant population remains low, communities like Morton in Scott County are an exception. The county's Hispanic population jumped 1,000 percent from 1990 to 2000, as Tyson Foods and other poultry processors recruited immigrant labor, said Angela Stuesse, a family friend and professor at the University of North Carolina in Chapel Hill. The Vargas family answered the call, leaving Daniela's grandmother and other relatives in Cordoba, Argentina. Immigrants "like Ms. Vargas just want a better life for themselves and their families and are true believers in the American dream — they should not be pushed further into the shadows," Rep. Bennie Thompson, D-Mississippi, said in a statement Thursday. Immigration and Customs Enforcement agents detained her father and brother at their home on Feb. 15, but left her alone at the time because she said she had DACA status, the agency said Wednesday. Diana Hodges said she helped her normally bubbly friend clean up the mess agents left behind — drawers pulled open, clothes strewn everywhere, papers scattered on the floor. Agents later "verified that Ms. Vargas does not currently have approved DACA status," and detained her as an "unlawfully present Argentinian citizen" on March 1 "during a targeted immigration enforcement action," the ICE statement said. The agency has not responded to requests for more details. Her detention immediately following the press conference seems like "a mean-spirited attempt at retaliation," said Mo Goldman, an attorney with the American Immigration Lawyers Association. The waiver program, which once entitled Argentines to stay in the U.S. for up to 90 days without a visa, required them to waive rights to a hearing before a judge if they overstayed, Goldman said. But "the tricky question is, when someone is seven years old, are they actually waiving their right to a hearing when they enter the United States?"